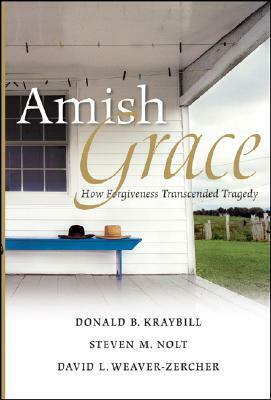 Following-up on the SpokaneFAVS Coffee Talk from last Saturday about forgiveness and my post about it yesterday, this is my review of the book Amish Grace: How Forgiveness Transcended Tragedy which looks at the response of the Amish community to the devastating shooting that costs several young girls their lives. I originally read this book (and wrote this review) in November 2011. This is my thirteenth attempt this week to write this review. I've started a dozen previous times only to scrap my feeble first sentences when I can't seem to get any traction. Words fail me every time I try to describe my emotions when I first read about the school shooting at the West Nickel Mines Amish School in rural Pennsylvania in October 2006. Of course, any school shooting is cause for sadness and anger, fear and heartbreak, confusion and worry, but the premeditated murder of these young Amish girls is beyond unfathomable to me. I can't imagine how it would feel to have a loved one so young and innocent taken away from me so suddenly, so violently. However, what I find even more extraordinary, almost inexplicable, is the response of the Amish families immediately following the tragedy. As a community, they reached out to the shooter's wife and children and to his parents, all of whom lived close by. Many attended the gunman's funeral to offer comfort to his family. The committee formed by the community to choose where donated funds would be spent designated some of the money they received for the shooter's widow. They grieved, felt anger, and wept; they mourned those they lost and supported those who were healing from their injuries, but unanimously reserved judgment for God and God alone. In one interesting section, the authors address a question they fielded from many media outlets in the aftermath of the shooting: “Are the Amish prepared to deal with a tragedy like this?” Their paradoxical answer was “Of course, the Amish were not prepared... – except, of course, they were.” In reality, “no community is ever prepared for such a calamity” and the Amish are no exception. In fact, with their low incidence of crime, extremely selective use of technology (which almost completely excludes violent images from video games, television shows and movies from their experience), and a deep sense of security that comes from living where your neighbors are also your family and long-time friends, the Amish would seem to be less prepared than most for such an event. However, the close-knit community of family and friends bound together by a common faith and culture provides an immense well of strength, support and “mutual aid.” In addition, “forgiveness is woven into the very fabric of Amish life, its sturdy threads having been spun from faith in God, scriptural mandates, and a history of persecution.” The forgiveness and grace that the Amish demonstrated were “spontaneous expressions of faith” that sprang from their love of God. If all Christians – all people of any faith – would emulate the Amish in this, our world would be much better off.